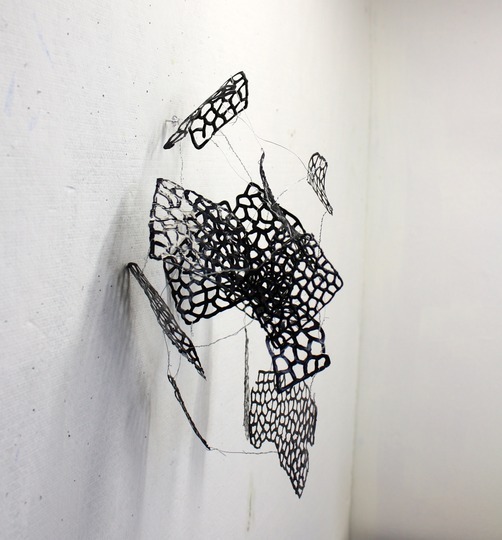 Ben Pranger, Hello?, acrylic paint and wire, 12" x 8" x 6"
Ben Pranger has shown his sculpture, works on paper and installation throughout the U.S., with reviews in publications such as Artforum, Art in America, ArtNews and Art Papers. He has participated in artist residencies at Kohler Art/Industry, Fine Arts Work Center of Provincetown, the Marie Walsh Sharpe Program, and the Virginia Center for the Creative Arts. He has received sculpture grants from the Virginia Commission for the Arts, the Virginia Museum of Fine Arts and the Pollock-Krasner Foundation. He has taught at Bloomsburg University of Pennsylvania, the School of the Art Institute of Chicago and Hollins University in Virginia. He is currently based in New Jersey. 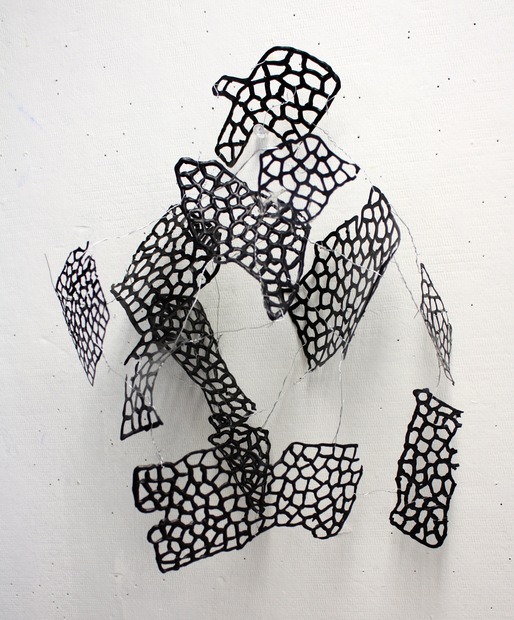 It’s an interesting problem: translating the 2D drawing into a sculpture. I liked the floating shapes of the original drawing and wanted to project them 3D space. My 11-year old daughter helped me with this project. She likes the TV show “Cake Boss” and we decided she should practice cake piping by squeezing acrylic paint from a plastic bag to redraw the shapes of the drawing. I printed out and enlarged the images, and also put them under plastic wrap so the paint would release from the paper. Now the shapes are freed from their flat world and are in the process of reassembling into another work.